Dubbed as the most delicious event since macaroni met cheese, Sony Pictures Animation’s “Cloudy with a Chance of Meatballs,” an adaptation of the bestselling children's book about a small American town where food falls from the sky like rain, will be shown in IMAX 3D cinemas and Digital 3D theatres simultaneously with the film's wide release in conventional screens across the Philippines on January 27. “The concept of food-weather seemed perfect to experience in 3D,” says co-director Christopher Miller. The special IMAX 3D release will be digitally re-mastered from Sony Pictures Animation's Stereoscopic 3-D master into the state-of-the-art image and sound quality of The IMAX Experience(R) with IMAX DMR(R) (Digital Re-Mastering) technology. “`Cloudy with a Chance of Meatballs’ is a fantastic animated motion picture that will play extraordinarily well in any format, but in IMAX 3D and Digital 3D, audiences will practically be able to feel the food landing in their laps," said Rory Bruer, president of worldwide theatrical distribution for Sony Pictures Entertainment. "Sony's new title is a great family story, and we believe the 3D storytelling will resonate with IMAX audiences worldwide," said IMAX CEO Richard L. Gelfond. "Our growing commercial theatre network will enable us to share this special title with more audiences worldwide, and we're pleased to partner with Sony to deliver a brilliant film in IMAX 3D." 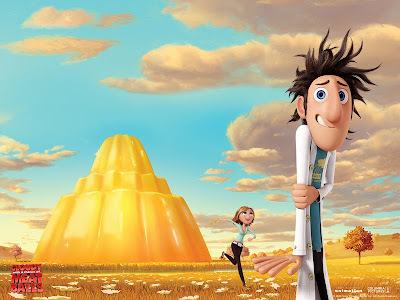 `Cloudy with a Chance of Meatballs’ is a great addition to our film slate," added Greg Foster, Chairman and President of IMAX Filmed Entertainment. "This all-star cast of talent and animation artists combined with a wonderful story will transport moviegoers from their seats right into the fantasy world that is Swallow Falls." Bill Hader, star of “Night at the Museum: Battle of the Smithsonian,” will voice Flint Lockwood, a young inventor who dreams of creating something that will improve everyone's life. Anna Faris, who recently turned heads as the star of the comedy hit “The House Bunny,” takes on the role of Sam Sparks, a weathergirl covering the phenomenon who hides her intelligence behind a perky exterior. James Caan plays Tim Lockwood, Flint's technophobic father. “Cloudy with a Chance of Meatballs” is distributed by Columbia Pictures, local office of Sony Pictures Releasing International. Visit www.sonypictures.com.ph to see the latest trailers, get free downloads and play free movie games.